American University chemistry researchers and scientists at the National Institute of Standards and Technology (NIST) have found a better furniture smoldering test that gauges how well upholstered furniture can resist combustion to delay the possible onset of fire. In the United States, fires in which upholstered furniture is the first item ignited account for about 6,700 home fires annually and result in 480 deaths, according to the National Fire Protection Association. These fires can be started from an open-flame source, such as a candle, or from a smoldering source, such as a lit cigarette or incense. 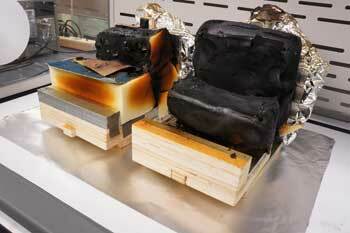 In the standard furniture smoldering test, two foam pieces about two-inches thick are covered with fabric and placed in a wooden frame to replicate a small-scale version of seat and back cushions. It mimics a scenario where furniture foam sits on a non-air-permeable substrate (e.g. the wooden frame). A cigarette (certified to burn consistently) is placed in the frame's crevice. To pass the test, the lit cigarette should not cause sustained smoldering of the fabric or the underlying foam. Household furniture typically includes open wooden frames and springs, which enhance air flow through foam and increase the propensity for smoldering. The researchers changed the frame design to allow for air flow by including wire mesh to separate the foam pieces from the wooden frame. Their design better represented real furniture and provided a more realistic simulation of smoldering. In the process, they also identified foams that could be used for better smoldering consistency. "Our goal is to help regulators develop a more realistic smoldering test. Our results show that the current test can severely underestimate smoldering propensity in real furniture," said AU Assistant Professor and NIST researcher Mauro Zammarano. "We recommend that regulators who administer the test consider creating gaps in the frame design to increase air flow." Read the complete Smoldering Test article from American University, posted April 4, 2014.